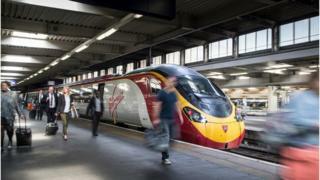 Virgin Trains claimed the current growth rate means annual passenger numbers could hit 50 million by 2026, which is when HS2 is due to open between London and Birmingham. The rail operator said the increase in passenger numbers was due to its investment in the west coast route. Managing director Phil Whittingham said: "We have worked tirelessly with government and industry partners to completely transform the west coast route, introducing a fleet of new trains, achieving one of the biggest timetable changes since privatisation without a hitch and bringing a focus on customer experience that the industry had not experienced before." A Campaign for Better Transport report published this week found that investment in services on the west coast mainline since 2009 has cut journey times by up to 28% and led to seven million fewer car journeys per year between London and Manchester. The campaign's chief executive Darren Shirley said: "At a time when rail investment is being questioned because of poorly implemented timetable changes, problems with franchises and over-running and over-budget projects, it is easy to lose sight of the huge benefits which can be achieved. "Rather than being happy side effects, outcomes such as lower carbon emissions, support for local economies and tackling road congestion should be regarded as a direct consequence of support for the railways."